Rosacea can often be treated effectively with topical (externally applied) treatments. If that doesn’t help enough or if the symptoms are severe, other possible treatments include medications that are swallowed, laser treatment or light therapy, and sometimes surgery. A lot of people have a number of different symptoms at the same time. The individual symptoms can vary in severity, too. The most suitable treatment options will depend on the main symptoms. Mild rosacea (type 1) with facial redness and small visible blood vessels can be treated with brimonidine tartrate. This medication makes the blood vessels narrower, reducing the blood flow to the face and decreasing the redness. But it doesn’t help in the treatment of other types of rosacea (types 2, 3 and 4). Brimonidine tartrate gel is applied to the skin of the face once a day (for instance, in the morning). It should not be applied to the eyes, lips, mouth or nostrils. Up to 1 gram of the gel should be enough each time you use it. This is about five pea-sized amounts: one for the forehead, one for the chin, one for the nose and one for each cheek. In the first week of treatment, people are advised to use smaller amounts at first and then gradually use more as needed. Once the gel has been absorbed and the skin is dry again, you can use other creams and cosmetics too. Research has shown that brimonidine tartrate reduces facial redness a little in many people, and a lot in some people. It usually starts working within one hour and the effect lasts up to twelve hours. The possible side effects include skin irritation and allergic skin reactions that make the skin even redder. It’s important not to get any of the gel in your eyes because it can temporarily lower the fluid pressure inside the eyes. Laser treatment or intense pulsed light therapy are particularly suitable for rosacea with bothersome red blood vessels. Both treatments involve damaging the small blood vessels using heat (also known as cauterizing). But there is hardly any research on these treatment approaches. In Germany, the costs are not covered by statutory health insurance. The possible side effects include superficial burns that lead to blisters, crusting and swelling. But these usually heal and go away within a few days. Type 2 rosacea with red spots (papules) and pus-filled spots (pustules) can be treated with various externally applied medications. The most commonly used topical medications include creams, gels or lotions containing azelaic acid, ivermectin or the antibiotic metronidazole. Several studies have shown that these medications reduce the skin problems or even make them go away completely for a while. A noticeable improvement can be seen after about three or four weeks. Most people tolerate the medication well. The possible side effects include minor skin irritation, itching and dry skin. Azelaic acid (trade names: Skinoren, Finacea) reduces inflammation and helps prevent pores from becoming blocked. The gel is carefully applied to the affected areas of skin in the morning and in the evening. Half a gram is used per application. That’s about the amount that is squeezed out of a tube along the last section of an adult’s finger (about 2.5 cm long – see illustration). 64 out of 100 people who did use it. In other words, azelaic acid relieved the symptoms in 20 out of 100 people. Ivermectin (trade name: Soolantra) reduces inflammation and also fights certain hair mites that play a role in rosacea (demodex mites). It is applied to the facial skin once a day. A pea-sized amount of the cream is used on each of five areas: the forehead, chin, nose and each of the cheeks. Contact with the eyes, lips and mucous membranes should be avoided. Once the cream has been absorbed by the skin, you can use other creams and cosmetics too. Ivermectin is used for up to four months. The treatment can be repeated if necessary. 71 out of 100 people who did use it. In other words, ivermectin led to a clear improvement in 34 out of 100 people. But the studies didn't check whether or not the participants had hair mites before using this treatment. So it isn’t clear whether ivermectin is more effective in people who have hair mites. Metronidazole is an antibiotic medicine that reduces inflammation. It is very commonly used in the treatment of rosacea. A thin layer of the metronidazole cream, lotion or gel is applied to the affected skin once or twice a day. It’s important not to get it in your eyes or on mucous membranes. People who use metronidazole should also avoid too much exposure to UV rays, for instance in sunlight or tanning beds. A few studies have compared azelaic acid with metronidazole, but they led to contradictory results. So it still isn’t clear whether one is more effective than the other. If topical treatments don’t help enough or if the rosacea symptoms are severe, oral medication (to be swallowed) may be considered. The antibiotic medication doxycycline is then typically used. Doxycycline fights bacteria and also reduces inflammation. When used to treat rosacea, it is often taken at lower doses than when used to treat bacterial infections alone. Because oral doxycycline enters the bloodstream and travels around the whole body, it causes more side effects than topical treatments do. The possible side effects include diarrhea, nausea and sensitivity to light. Sometimes rosacea causes the skin on the nose to become thicker (type 3), making the nose look large and bulbous (rhinophyma). Other areas of skin on the face may be affected too. There is a lack of good research on how best to treat early stages of rhinophyma. Sometimes people try out isotretinoin capsules over a period of several months. In Germany, this medication has only been approved for the treatment of severe forms of acne. So it is only used cautiously in the treatment of rosacea. People with rhinophyma often have enlarged oil glands (sebaceous glands) in their skin. Isotretinoin causes these glands to shrink. But there is currently no research on how well it works in the treatment of rhinophyma. 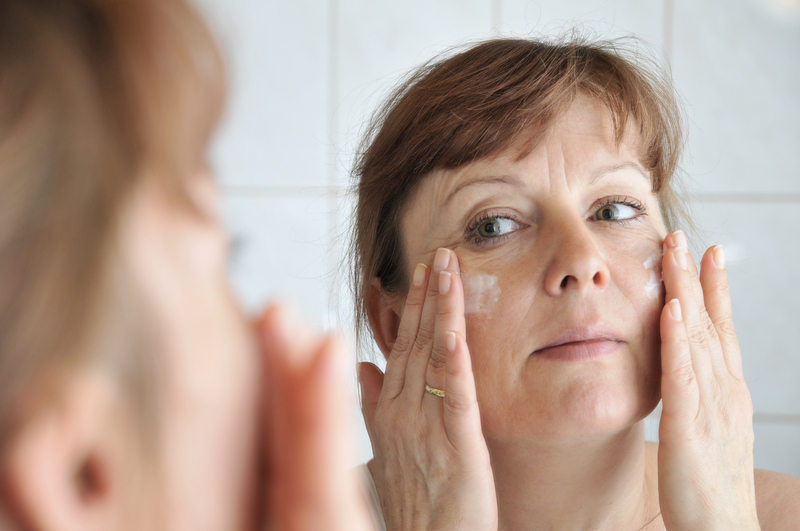 Isotretinoin may irritate skin and mucous membranes, as well as make them dry and sensitive to light. Blood lipid levels and liver values sometimes increase when using this medication, so they are regularly monitored during the treatment. Very severe rhinophyma with a swollen and bulbous nose can be operated on or treated with certain laser therapies. These treatments involve numbing the area and removing excess tissue to try to restore the normal shape of the nose. There is a lack of good research here, too. If rosacea affects the eyes (type 4), it's a good idea to see an eye specialist too. In rare cases, deeper layers of the eye may become inflamed. Blocked sebaceous glands in the eyelids can be unblocked using warm compresses and gentle massage movements. It is best to ask an eye doctor to show you how. Depending on the severity of rosacea-related eye problems, doctors may suggest treatment with artificial tears and eye drops containing antibiotics or ciclosporin. Ciclosporin reduces inflammation. If that isn’t enough, treatment with doxycycline tablets may be considered. Unfortunately there’s a lack of research on treatments for rosacea-related eye problems, too. So it’s not possible to say which treatment is the most effective.